Xelina Leyba the gatekeeper at Bar Tartine. This is The Gatekeepers, wherein Eater roams the city to meet the fine men and women standing between you and some of your favorite dining destinations. These days, front of house operations are more important than ever (cf. the first item in yesterday's edition of The BauerBlog), so we thought it only appropriate to break the ice on the second season of The Gatekeepers. For the premiere episode, we go to Bar Tartine on Valencia, where chef Jason Fox is quietly but quickly amassing a very strong following, both in the evenings and on the weekend brunch scene. While Fox does his thing in the kitchen, patrolling the door and juggling the small dining room is the lovely Xelina Leyba (the "x" is pronounced with a "ch" sound, mind you). 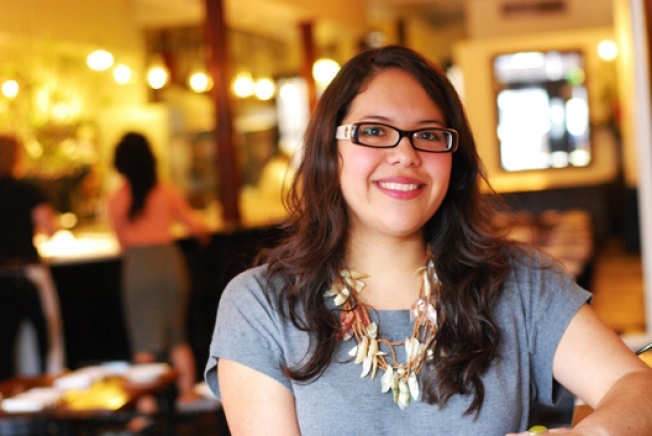 Xelina "Xeli" Tonantzin Leyba, General Manager at Bar Tartine: We have fifty seats total: 40 table seats and 10 seats at the bar. I love the table in the window and the "mafia" table in the back corner because they’re ideal for people watching. The bar seats are also great. The marble bar is beautiful and big, so you can sit cozily next to each other but still enjoy plenty of space. 8 PM on a Saturday night. What’s the wait for a table? No time at all if you have a reservation. Without a reservation, the wait can be anywhere from no time to an hour. We do take down names and numbers so you can walk around the neighborhood, or you can stay with us and get a glass of wine while you wait. All of our bar seats are for reserved walk-ins and we always like to set aside a table or two for walk-ins as well. Bar Tartine's brunch is popular too. What's the wait at peak times on the weekend? For a party of three or more, it can be up to an hour at the busiest times. Getting a deuce seated is much easier, especially if you are open to sitting at the bar. The good thing about brunch is that the dining time is much quicker than dinner, so we can usually accommodate more people. Does the brunch crowd differ from the dinner crowd? Many of the same people come through for brunch and dinner, but I would say the brunch crowd is definitely more casual and relaxed. I think that also has to do with the fact that brunch itself is more casual, and it lends itself to bigger groups, whereas dinner for two is more intimate. Is there anything I can say to make my wait shorter? Not really -- I've yet to hear anything magical that shrinks the waiting time! We do our best to get everybody seated as quickly as possible. It can be a delicate balance, but we're a team, and we work with the servers and the kitchen to get everybody seated and served in a timely fashion. We plan seating meticulously, so our time estimates for walk-ins are pretty spot-on; that makes it a lot easier for guests to just relax and know when they’ll be seated. Ever been offered gifts or cash? Never in San Francisco! The Bay Area is such a respectable place that it just never happens (or it hasn't to me). And honestly, it’s not as if we have anything to offer in exchange for cash or gifts other than what we already give every guest as a matter of course. That being said, I was once offered $200 in cash from a regular customer while hostessing in La Jolla! Tell us about your favorite customers. Any celebs been by recently? We're equally happy to see new and familiar faces at Bar Tartine. It's always exciting to see first-time diners so enthusiastic about what we're doing here, and even more so when they come and visit us again. We've had some celebs pass through and a few that dine with us regularly, but we can't say who. It's like kissing and telling! How do you deal with VIPs, when there are no tables left to give? Everybody's a VIP here. Friends sometimes let us know in advance that they are coming, but just as often, regulars pop in at the last minute without expecting preferential treatment. Since the entire bar and a few tables are always set aside for walk-ins, there’s no need for VIPS (or anyone) to worry. As for brunch, it’s walk-in only. What’s your favorite dish at Bar Tartine? And what is the most popular dish? So many! Right now, I really love our heirloom potato and carrot salad. It sounds simple, but is actually quite complex and full of flavor. Another favorite of mine, the Squid and Pork Belly appetizer, has become one of Jason Fox's signature dishes. It has made appearances on our winter menu two winters in a row because guests keep asking for it. As for sweets, the Banana Parfait is to die for. It's brûléed and comes with a hot buttered rum sauce and a homemade graham crumble. I hype it up so much that I always think I've gone too far, but everybody goes crazy for it. Where are you eating when you're not here? I'm pretty much always eating Bar Tartine fare, but I also indulge in Arinell's Pizza and Bi-Rite's culinary delights. How, if at all, has the economy affected things for you? We have been lucky to stay busy these last few months, so not very much. We always try to be mindful of our guests, which is one of the reasons we keep our mark-ups for wine on the lower end. What’s the one Gatekeeper tool you need to do your job? A great staff! We have such a small staff, and everybody works together to do their best to ensure a great experience for all the guests. The relations between the back and front of the house are really tight, and we hope that translates into a seamless experience for our guests.